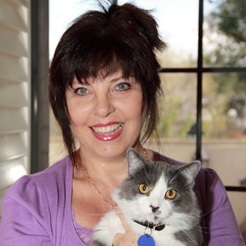 Sandy Robins is an awarding-winning multi-media pet lifestyle expert, author and spokesperson. She is the 2013 recipient of the Excellence in Journalism and Outstanding Contributions to the Pet Industry Award presented by the American Pet Products Association to individuals in the media who have the power to influence millions of people and use this to positively promote the joys and benefits of pet ownership. Her work focuses on lifestyle trends that improve our pets’ general health and wellbeing, and ultimately enhance the human- animal bond whether its state of-the-art surgical procedures to the latest pet travel ideas, nutrition, haute couture designs and new home decor trends. She works as a pet lifestyle spokesperson for Petco and has worked with other corporations such as Toyota promoting pet safety in vehicles, American Airlines, Innovet Pet Products, Nestlé Purina and Merrick PetCare. Her two cat books, Fabulous Felines: Health and Beauty Secrets for the Pampered Cat and For The Love of Cats have both won awards from the Cat Writers Association of America of which she is a longtime member. She is also a member of the Dog Writers Association of America and the recipient of The Humane Society of America’s Pets for Life Award. Sandy is a regular contributor to popular sites such as Today.com and AOL’s PawNation and national publications from Consumers Digest to pet centric magazines such as Dog Fancy, Modern Dog, Cat Fancy, Cats USA annuals and industry leaders such as Pet Product News International and Pet Age. Sandy is a popular TV and radio guest and also hosts her own radio segment called House Pets which is part of the On The House show which is syndicated to 200 radio stations nationwide. She is a besotted pet parent to cats Fudge and Ziggy and lives in southern California.